Alessandro and I have been travelling around Northern Laos and Northern Thailand for just over a week now. We have been getting up early to watch the hustle and bustle of the morning markets, wandered through the grounds of stunning temples, walked along the banks of the Mekong river, travelled on local buses so full people were sitting on rice bags in the middle of the aisles and swam in the turquoise water of one of the most beautiful waterfalls I have ever seen. While every trip comes with its own challenges, whether it be jet-lag, getting sick, over-hyped destinations, missed flights or buses – and this trip has certainly had its fair share of that as well – I am so glad we decided to go on this trip. Time seemed to have stopped while we are taking in our new (and temporary) surroundings with all their new-to-us sights, smells and flavours. Above all, it is so nice to spend some one-on-one time with Alessandro away from our busy lives before my upcoming move to Brussels. The food we have been eating in Laos (and especially the desserts) could not be more different from today’s recipe, however delicious it is. There have been a lot of coconut-based desserts, whether it is the sticky purple rice cooked in fresh coconut milk and served with local fruits that we learned to prepare at a cooking class in Luang Prabang or the grated coconut filled deep-fried dough balls not unlike doughnut holes we bought at Luang Namtha’s morning market before heading off on a couple of days of trekking through the jungle. What today’s recipe and those desserts do have in common is that they are incredibly sweet, almost tooth-achingly so. Treacle tart, a long-term favourite with children and adults alike in the UK, has recently gained in popularity and even acquired some international fame thanks to Harry Potter, who counts treacle tart as one of his favourite desserts. The tart typically consists of a crisp pastry shell filled with a chewy and tooth-achingly sweet filling of breadcrumbs mixed with golden syrup and treacle. Often the filling also contains some lemon juice – to tame the sweetness. Treacle tart aficionados might recoil in horror at what I have done to their childhood favourite. But bear with me – a few simple changes to the classic recipe is enough to produce a grown-up version of the treacle tart that is nonetheless tooth-achingly sweet and delicious just like the original. For this recipe, I used a dark cardamom and sea salt-flecked rye pastry which encases a sweet filling of coarsely ground rye bread stirred into gently warmed acacia honey and which is finished with a sprinkle of sea salt. Paired with something tart to cut through the sweetness, like mascarpone, creme fraiche or even cream cheese, loosened with a squeeze of lemon juice and flavoured with a generous grating of lemon zest, the humble treacle tart becomes a rustic but elegant dessert, fit even for a dinner party. Note: while I am particularly fond of this rye version of a treacle tart there is nothing that says you could not use a slice or two of your favourite country loaf for the filling. The important thing is to pair the treacle tarts with something that will cut through the filling’s almost tooth-aching sweetness. A lemon scented cream works well, only lightly sweetened, if at all. A scoop of lemon curd or greek yoghurt ice cream would work too I think. 1. Start by making the pastry. 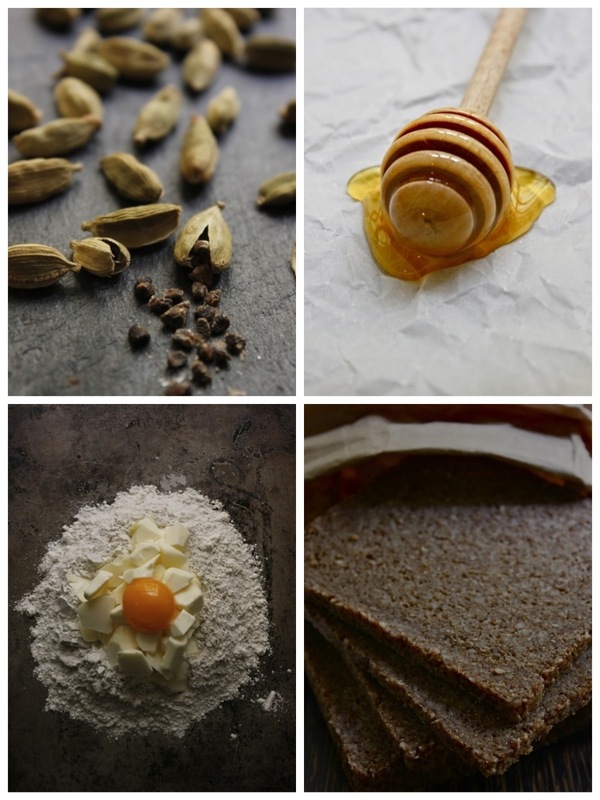 In a bowl whisk together the all purpose flour, rye flour, salt and ground cardamom. 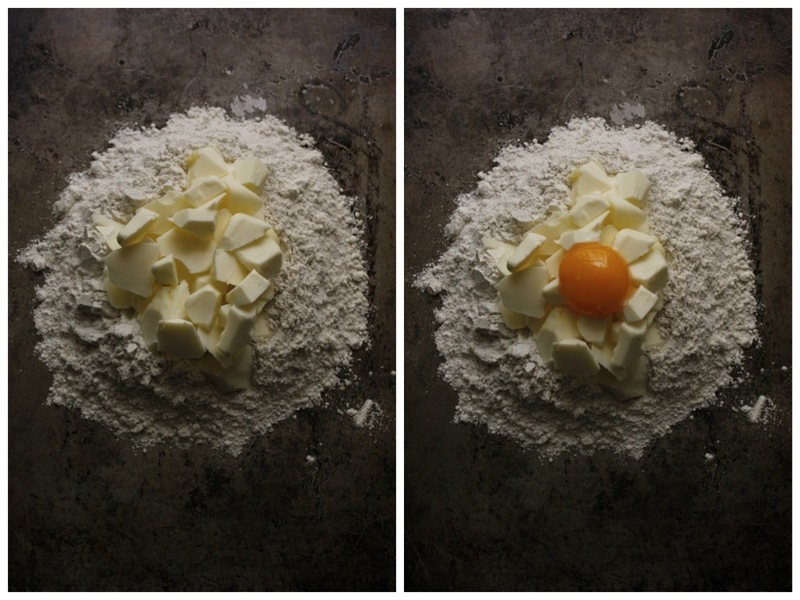 Form a well in the middle and add the butter and egg yolk. Using a knife or a pastry cutter, cut the the butter into the flour until the mixture resembles sand. Using your hands quickly bring everything together – if the mixture appears very crumbly and dry, add 1-2 teaspoons of cold water. Shape into a ball, wrap in cling film and place in the fridge for 30 minutes. 2. Pre-heat the oven to 200 degrees Celsius. On a floured surface roll out the dough to ca. 3mm thickness and line each tart pan with a round of dough slightly larger then the size of the tart pan. Prick each lined tart pan with a fork a few times. Place tart pans in the fridge while you prepare the filling. 3. In a small saucepan gently warm the honey until liquid. Stir in the breadcrumbs and the salt. 4. Remove the tart pans from the fridge and divide the filling evenly between them. 5. Bake tarts for ca. 15-20 minutes until the pastry is golden and crisp. While in the oven the filling will bubble up ferociously, but it will eventually settle back down again. 6. While the tarts are in the oven, whisk together the cream cheese together with the lemon juice, lemon zest and pinch of salt, adding a teaspoon of honey if you have a sweettooth. Store covered in the fridge until ready to use. 7. 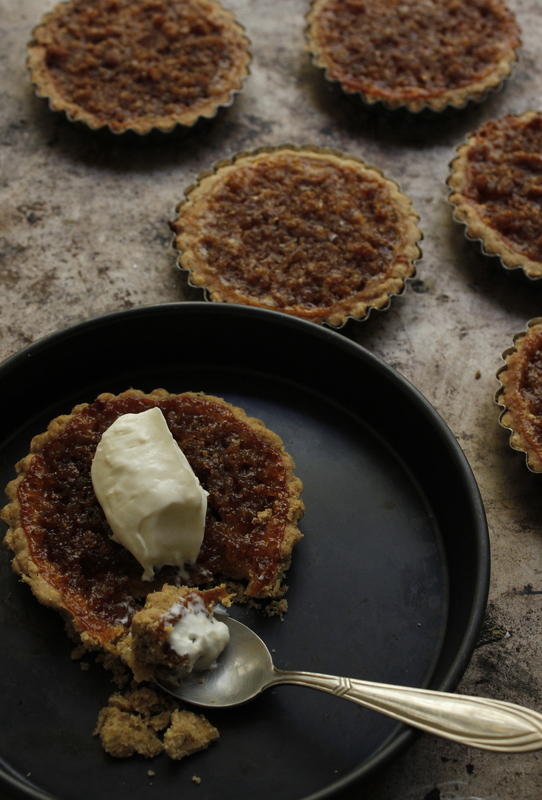 Serve each treacle tart with a tablespoon of the whipped lemony cream cheese. They look great and neat present……………. I’m always a bit dubious when people mess with treacle tart as I love it SO MUCH, but this looks like you’ve done it justice – gorgeous flavours! You are right – Bali was a mere 6 months ago I think. I do feel a bit greedy but Alessandro I might not be able to go on a proper holiday this summer so figured we would squeeze in a trip now while we both had a bit of time! And thank you – I am always highly suspicious when people tinker with my favourite dishes as well! Thanks! We just got back to Rome this morning – it was an absolutely incredible trip! Definitely need to go back to Laos at some point – I feel like we barely scratched the surface.